Why We Think Worms Are Vermi-licious! The word Vermi comes from the latin ‘vermis’ meaning worm. Vermicomposting, or worm composting, is an excellent way to convert household garbage into nutrient rich fertilizer. Composting with specialty worms known as Red Wigglers is a clean and environmentally friendly way to save tonnes of waste from going to landfill. If you Vermicompost you will reduce the amount of garbage being transported out of the province – The average Canadian produces a tonne of waste each year. Estimated 1/2 to 1/3 of household waste is organic matter. 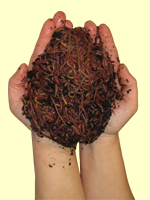 Worms produce beautiful black castings – a nitrogen rich natural fertilizer. Totally organic and one of the best soil additives on the planet. Use worm castings in house plants and gardens. Odourless when operating effectively – worms eat decomposing matter, therefore eating away any nauseous odours and leaving a fresh earthy smell. Take a look at her youtube video and you’ll immediately notice Cathy’s enthusiasm and expertise. In addition to her own wealth of information, the Cathy’s Crawly Composters website is definitely worth checking out. On this site you will find photos, question and comments, information as well as a kids corner and shop among other wormy things! Vermicomposting is the ideal solution for condo dwellers who do not have an outside area for large a composter. 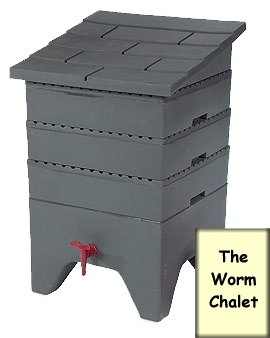 Her worm chalet (manufactured in Ontario!) is perfect for this. Currently the City of Barrie has 8 of these composters which are available for purchase on her website. In addition to everything else she manages to accomplish, Cathy does fantastic work teaching and engaging kids in the vermicomposting process. She is available for school workshops and even birthday parties! Great news then for anyone with kids or that would love to learn more about vermicomposting, Cathy will be joining us on Sunday June 12th at Ecofest Barrie! So what will we learn from Cathy? We will learn all about worms and vermicomposting – a viable solution for on-site management of food scraps and paper.Discover how worms convert organic matter into nature’s finest soil amendment known as castings. Feed the soil, not the plan t. Find out how worms benefit the environment. During the presentation, vermicomposting is explained from set-up to harvest. Worm eggs, castings and worm bins in various stages are displayed. Entry filed under: City of Barrie, composting, gardening, Uncategorized. Tags: barrie, cath'y creepy crawlers, compost, ontario, vermicomposting, worms.